I read about Sarah's impressive achievements. Funny thing with those of us who learned to play the piano (including me)..somehow, we would yearn to try out other instruments like the violin or guitar. I gave up on learning the guitar coz my fingers were hurting from pressing the guitar strings! I am not very musically inclined but I love listening to good jazz. My favourites are Diana Krall, Michael Buble and Norah Jones. I know very little about classical music. I listened to some but don't know their titles and composers. I came across a music in Kinokuniya bookstore, and then on a blog site. The blogger told me it was Canon in D.
Ugh! you're a freaking prodigy, aren;t you? GRR!!! lol nothing wrong with liking everything from Mozart ot Mariah CArey. I'm the same way. I've never heard of either violinist, at least not that I know of, but I'm going to go look them up and see if I can find more about them. Good to know that there is someone else out there who doesn't just listen to the mindless synthetic stuiff that is pumped from the radio these days. my bug life, haha! I also tried to learn the guitar when I started working, but gave up because too embarrassed to face the teacher every week. You know why? Cos I didn't practise most of the time due to busy work schedule, and also out of pure laziness! khengsiong, well if you like classical music, you can always buy some CDs to listen to. Frequent listening will make you love classical music more and more, It sort of grows on you, unlike pop songs which get stale after repeated listening. mystery man, I'm far from being a prodigy! But I do think I have some talent. LOL! I prefer songs - with lyrics, compared to instrumentals. Vanessa Mae...ok lah! Mariah Carey...eyew!!! Hahahahahahaha!!! I find listening to classical music wonderfully relaxing..! I had never heard of her but enjoyed this. I like all types of music including Mariah Carey! Ehh.. no.. I am not that classic yet.. hahahaha.. I agree, violin is a hard instrument to learn. You are truly musically inclined Foong. I wonder what kind of job you have? suituapui, I know, you like those songs from the golden oldies yes? Haha! monica, yes it's relaxing although some classical songs are so slow and long winded I just fall asleep listening to them! Haha! babette, oh yes! Violin is so difficult to master, but of course my violin teacher totally disagrees with me. He said piano is the more difficult instrument to learn. I guess to each his own. i'm into all kinds of music too except heavy metal. and i love vannesa mae. her performances are simply mesmerising. i've not heard of sarah chang's work though. life ramblings, oh so you are like me! Also don't like heavy metal. Haha! 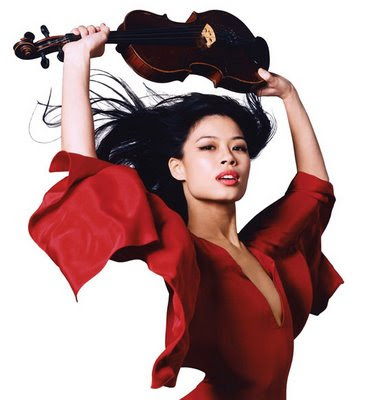 Vanessa-Mae is famous for her pop music (ie. commercialised) whereas Sarah Chang plays only classical music. i know vanessa may but not sarah. i just love piano so much even though i don't know how to play. richard clayderman is my all time hero! ballade pour adeline! I'm not into classical music and all that but for Vanessa Mae, I'll make the exception ... LOL! Sarah was a child prodigy, glad that she grew up maturely as a great violinist, but not yet a maestro. He was a complete opposite of Heifetz, even Primrose did a good take on his viola with this piece. nick phillips, haha! That's because Vanessa-Mae play mostly pop music, and she's got style, right? she is quite something heh. i wonder what happened to vanessa now. Yeah, they look cool don't they? But to me, playing the violin is not cool at all - it's so tough and challenging! i like playing musical instruments but i'm never good in them like violin and horn. but i would really love to take it up again. r u still practising the violin?? The 2 ladies you mentioned are great!Both have their own style. I like Joshua Bell too! hi.. i know i'm super late for a comment (1 year late..=.=") but when i read your post, i can't help commenting!coz i LOVEEE classical music very much as well and play the piano and violin as well.. similarly, my violin skills are terrible.. really terrible.. but u are better coz u manage to pass the Gr8.. me still struggling in Gr8.. lol.. but i still enjoy playing the violin although i don practise much.. my fault.. haha..
you will learn to enjoy the violin more than the piano once you learn it. violin is really really different from piano and it is very enjoyable to play. i still remember her words but sometimes i just can't realise her theory. haha.. at times, i just wan to let go of the violin and just concentrate on the piano.. but i know i will regret... lol..
i'm really indecisive! anyway, i admire you coz you are able to decide for yourself what is best for u.
Oh! So you play both the piano and violin! Maybe we can do a duet someday - you on the violin and me on the piano. Haha! I love classical music too, but I love all other types of music as well except heavy metal - you can say I'm eclectic. Haha! I don't quite agree with your violin teacher cos I've tried hard to like the violin but I just simply can't play it well! OK, maybe it's lack of practice, but I still prefer the piano! Of course, good violinists will beg to differ. LOL!